Inklined: To NaNoWrMo or not to NaNoWriMo, That is the question! To NaNoWrMo or not to NaNoWriMo, That is the question! Okay, so going into October, I was all set not to have anything to do with NaNoWriMo (National Novel Writing Month.) And then I found out that a number of my friends are doing, friends who I didn't even know wrote. They did script frenzy in March edit: April (isn't that when it is) and now a group of them are doing it again. And I want to. I really do. I haven't been writing very steadily, this semester and I think NaNoWriMo is just the thing for it. That being said, there is NO WAY I have time for my bible study, youth group, 4-H, piano, school, soccer, blogging, eating, sleeping, having a family, AND 1667 words a day for 30 days. I would need to add 12 hours to each day just to have time to breath. So what do you think, my dear readers? 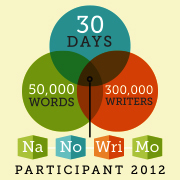 Are you going to be a 2012 NaNoWriMo participant this year? Would it be okay for Inklined to be neglected for 30 days while I bang my head against a key board? Let me know. I only have 8 more days to sign up! That's how long you have too. I'm doing NaNo! So excited. Yeah! I want to do it, I just don't know if I have the time. I've never really tried Nano, but I'd love too. Hence, the workshop. So, it write the book in Nov. finish in Dec. Edit and prepare submission package in Jan. and pitch in Feb. Sounds fun! Anyway, I was coming over to say say hi and let yo u know I enjoyed the Teen Read blog hop! Thanks for the heads up! I will defiantly swing by your blog later to check out the details. I'm so glad you enjoyed the Read Week Blog Tour! I think you should go for it. I let my blog slack a little last year for NaNo and I don't think it hurt anything. :) This year I'll be posting as usual, but it's all going to be pre-scheduled and NaNo-oriented.